Of course this blog is loaded and too long. At the end of it, I wonder if I should quit radio. 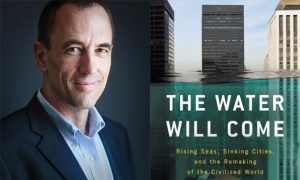 This interview is about Jeff new book “The Water Will Come: Rising Seas, Sinking Cities, and the Remaking of the Civilized World“. On Radio Ecoshock, we’ve just run a series of interviews on growing heat deaths, with more to come. With climate change, it seems rising seas and killer heat are in a race for public attention. How should w see the importance and impact of these two climate threats? In 2012, Dr. Peter Ward from Washington State University published his book “The Flooded Earth: Our Future In a World Without Ice Caps”. In my opinion, that was more of a scientists’ explanation, with a lot of focus on melting ice. Jeff’s book goes to many parts of the world to see what will happen, and is already happening, “on the ground”. For the awful truth about rising seas, watch Peter in this National Geographic special ‘Earth Under Water – Worldwide Flooding”. 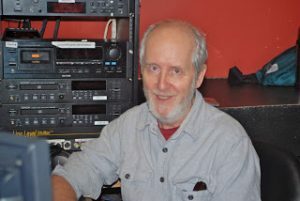 Or try this Radio Ecoshock You tube version of my previous 8 minute interview with Peter Ward about rising seas. Dr. James Hansen, the former head of NASA’s Goddard Space Center, is now saying we face several meters, more than 9 feet higher seas by the end of this century. That sounds incredible, but it is possible. James Hansen also said Earth could become, quote, “practically ungovernable” if seas keep rising. From the scientists I’ve talked with, it seems the words “rising seas” really emerge as many different impacts rolled into one big concept. In this interview we begin with one subset:the way rising sea levels appear as storm surge. If they have heard of rising seas at all, people put it way into the future, as a tiny little rise every year nobody can see. But with Hurricane Sandy, storm surge arrived all of a sudden with huge damage. So we can say storm surge is a fast way to experience sea level rise too. Another aspect that is hardly recognized by the public, is the growing intrusion of salt water into important agricultural lands. That’s true in Vietnam, parts of India – but it’s true in the Central valley agricultural system in California. But in the case of California, part of the driver of salt water intrusion is over-pumping of the groundwater for agriculture, inviting sea water into the water table. Find out more in this article from Stanford, and if you want to search for more info on this threat around the globe, use the term “salt water intrusion”. We discuss the facts of global food loss due to rising seas, in the century when we are still projected to add more billions of people. Research by scientists at Rice University found in the past sea levels went into a period of very rapid rise – something quite different from the slow 2 or 3 millimeters over a century shown on former IPCC graphs. It can be a meter in a decade. Imagine what happens to a major coastal city if that happens. And then there’s this new science just in from Science Advances in November 2017. Eric Larour et al say specific ice masses melting will affect specific cities. Should coastal planners have concern over where land ice is melting? We’re learning new twists to the sea level story every day. Jeff and I also talk about the economics of rising seas. It’s not a stretch to say the massive American real estate market could crash if the most expensive sea-side properties become worthless. Speaking of worthless properties, I’ve said Donald Trump’s Mar-a-Lago Club in Palm Beach will become a symbol of the dangerous lunacy of climate denial. Maybe future generations will erect a monolith above Mar-a-Lago to demonstrate the sea depth there. Like Canute, the denial industry cannot stop the rising seas. Do you think people in the United States and Europe will be able to withdraw from the coast in an orderly way, without a severe economic crash? In 2014, Jeff Goodell interviewed Microsoft founder Bill Gates for Rolling Stone magazine. Was he aware of the mega threat climate change poses for the world he works in? “Yes” Gates is aware, but he is a technological optimist, thinking that advancing technology, including new nuclear designs which Gates is funding, will help humans win. Find that article “Bill Gates: The Rolling Stone Interview – The richest man in the world explains how to save the planet” here. We humans tend to talk about ourselves, as though we are alone on this planet. On this show, coral experts like Charlie Veron say most of the world’s coral is unlikely to survive rapid sea level change. That was seconded by new research from Pankaj Khanna at Rice University in Texas. In Jeff’s book, I would have liked to see more the impacts of rising seas on other living things in the coastal biosphere – but that would take more years of research and another huge book. You have seen graphs of warming, as carbon grows in the atmosphere. But new research suggests all carbon is not equal. My take is that each unit of CO2 becomes more damaging to the climate, as the decades progress. If true, that could change the whole game, but I need help to understand why. As it turns out, by the end of this interview, my initial take on this paper was wrong! It’s not so much that new carbon hurts the system more, as the current carbon emissions have growing impacts as time goes by. Oh well, climate science isn’t easy. Go with the interview, and you’ll get it too. We explore that new paper, published in the Proceedings of the National Academy of Sciences on November 28th. The lead author is Paulo Ceppi. He is a Postdoctoral Research Assistant with a lot of scientific papers to his credit, at the Meteorology unit, University of Reading, UK. The full reference for this paper is: Ceppi P, Gregory, J (2017). ‘Relationship of tropospheric stability to climate sensitivity and Earth’s observed radiation budget’. Proceedings of the National Academy of Sciences of the United States of America. There is an Abstract for that paper here. Earlier, Dr. Ceppi did research and published papers on the Southern Hemisphere. He’s done a lot on clouds, and some of his recent papers sound intriguing for sure. The key factor we need to know, but do not have nailed down (because it is so complicated) is “climate sensitivity”. “Climate sensitivity” has been defined as the amount of warming expected if the CO2 doubles over pre-industrial levels. So if we take 280 ppm as pre-industrial (some debate about that number) and double it, we look at 560 ppm That’s not far away, when we consider we are above 450 ppm in CO2 equivalent, by not leaving out the other warming gases, from nitrous oxide to methane and beyond. Nature doesn’t leave anything out. The next doubling would be 1120 ppm, but by then, all bets from models are off. I would say, due to the unknown quantity of feedbacks, possible extreme events, just unknown unknowns. We may not survive that much heating anyway. 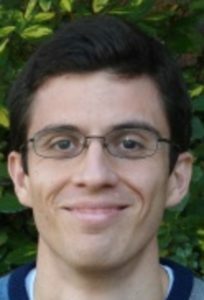 In this interview, Paulo Ceppi explains climate sensitivity and his work. One of the more difficult aspects, for both climate models and the coming reality: what will clouds do as the Earth warms. There have been several theories about this, some saying clouds will cool the Earth, reducing climate damage, while others say they will change in ways that warm the Earth. This new research leans toward the clouds will add to warming, but not in a simple way. In this interview, we briefly discuss another paper where Ceppi was the lead author. It’s title is: “Fast and slow components of the extratropical atmospheric circulation response to CO2 forcing.” We also touch on “sudden stratospheric warmings“. As I understand this paper, the reduced cloud cover doesn’t sound universal all over the globe, but in “some sensitive regions”. Years ago, another cloud specialist, Timothy Garrett at the University of Utah, told me that cloud science was one of the last unexplored frontiers of science. The chaos and difficulty of study left a lot of questions, he said. There is some great science in this interview with Paulo Ceppi, and it’s worth working through to the end, where I hope you will discover it’s real meaning, as I did. Thank you for listening to Radio Ecoshock. And a special thank you to listeners who sent me an early Christmas present with a few donations and a couple of new subscribers. To be honest, I was feeling down after last week’s interview with Patrick Brown. If the models have been underestimating reality, and we really could warm 5 degrees C by the end of this century, is it really all over? Are we just discussing the details of our funeral plans? That despair was matched by the utter lack of any public climate movement. Sure 350.org is doing their best, so is Greenpeace. But we’ve just had two big government climate meetings, with hardly any noticeable public protests or demand for action. Yes, scientists just met at the American Geophysical Union to talk among themselves, but like the COP climate talks, they are just talk. Watch this You tube video rant by Ottawa scientist Paul Beckwith. And there’s also this huge recent debate (November 2017) (1 hour 30 minutes) between scientist Michael Mann and David Wallace Wells: “The Doomed Earth Controversy”. Where are the giant international meetings to prevent disastrous climate change? Is there any signal from the motoring public that we are ready to change, even a little? Meanwhile, I’ll toss on a replay for next week, while I spend time with my kids and grandchild. Maybe that will help me regain a new focus for a new year, with another season of new Radio Ecoshock shows. Thanks so much for what you do. It seems that it’s ‘uncool’ to care in our society, that’s my impression. Such a tragic waste of such a beautiful place. Your radio shows are hugely important and you do a very good job of interviewing. Thankyou. Alex: you are a light — and a very, very bright one — in dark times. Please keep on. I know how much your show means to me (and other climate activists), and how much I’ve learned listening to your shows (some I’ve literally listened to a half dozen times, like David Collings). I am forever in your debt for the incredible education I’ve received from you (despite the terrible news). I look forward each week to your show Alex. Even though it’s often sobering news, there is still someone putting it out there and that is very important in my estimation. Carpe Diem! Enjoy living today. You are too depressing to continue listening to your podcasts anymore – you sinked with this podcast. Just deleted from my links. I gather that these researchers are not fans of Guy McPherson….and I agree he is depressing to listen to and I sure hope he is just nuts. However, the this talk implies that climate change is not as urgent as McPherson claims, and makes it sound like we have lots of lag time. Do we, or don’t we??? If we have lots of lag time, why worry so much? Please let us know when is the point of no return, or will that never happen ? Their disdain, year after year after year after year, for McPherson implies our situation is not so urgent and never will be. I fear that our fear of fear-mongering is dooming us. Alex, I don’t blame you for being depresseed. The news is all depressing, espcially if you have young children in your extended family. But please keep up the good work – you are a light in the darkness, as somebody said above. Life is increasingly resembling an episode of StarTrek: The Next Generation. In “The Inner Light,” a story I found moving even three decades ago, Captain Picard lives out an entire life as man on a doomed planet, with marriage, children and grandchildren all set against the backdrop of planetary destruction. Selfishly I would implore you to continue doing Radio Ecoshock, as it is informative and fascinating, even if morbidly so. But realistically it looks like we are NOT going to act adequately or in a timely manner, and are almost certainly passed the point of no return. So if you decide it’s in your best interest to focus on your family and “enjoy life while it’s still possible”, I fully understand. Alex, I look forward to listening to your show every week. I don’t have time to keep up with the science, so your show really helps me keep abreast of what is being discovered by the climate researchers. It also helps me to know that I’m not the only one who struggles with the implications of the science. It is so nice to hear the voices of the scientists on your show and to be able to relate to them as humans. I hope that you can find the energy and passion to continue. Regards from Bolivia.